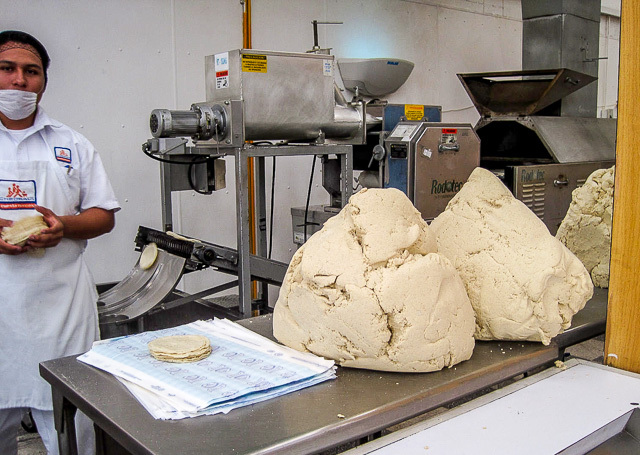 That’s the dough used to make fresh corn tortillas each morning in the markets of Cozumel. 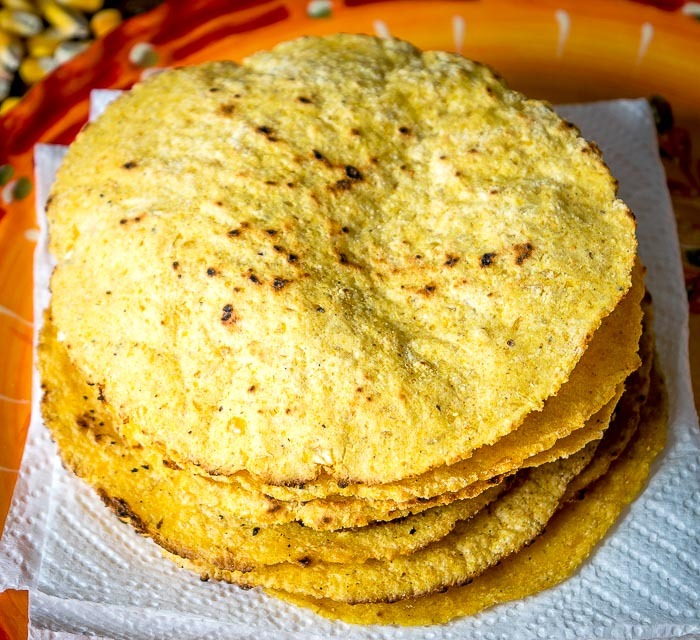 Making a batch of these beauties comes with two main benefits, the most obvious being a stack of corn tortillas that are good enough to be eaten on their own. The other, hidden benefit is that your taste buds will now have a built-in tortillameter that you can use to gauge the quality of tortillas sold in your neighborhood. It will help you stay away from the ones that have strayed too far away from the nixtamalization process. 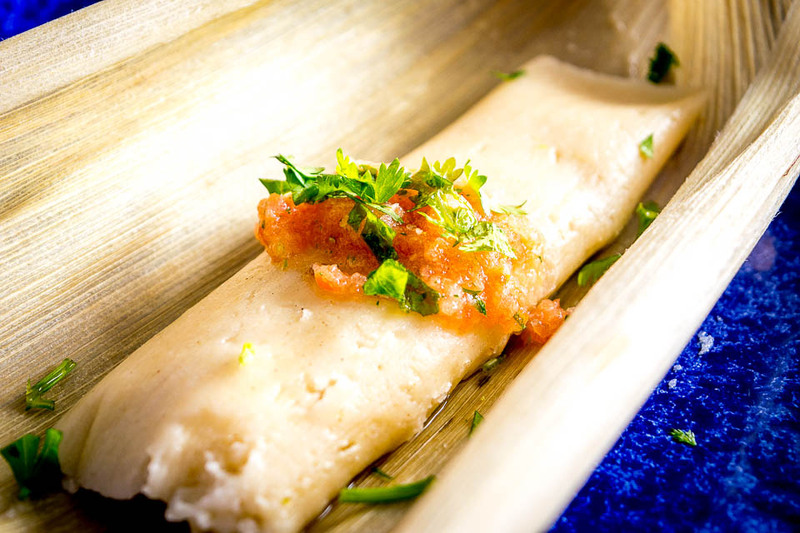 Our Mexican Cooking Crash Course is only for people who are tired of greasy taco joints. All others please carry on as if you did not read this. Enough chatting, how do I make ’em? OK, all you need is 2 cups of masa harina, 1/2 teaspoon salt, and 1.5 cups of warm water. Add the 2 cups of masa harina and 1/2 teaspoon salt to a mixing bowl. Now start adding the rest of the warm water incrementally, a couple tablespoons at a time, and stirring regularly. The idea is to keep adding water until the flour bits meld into a dough. At that point you can pick it up with your hands and knead it together. But there is some trial and error along the way as the exact amount of water used can vary. If the dough is sticking to your hands there is probably too much water. 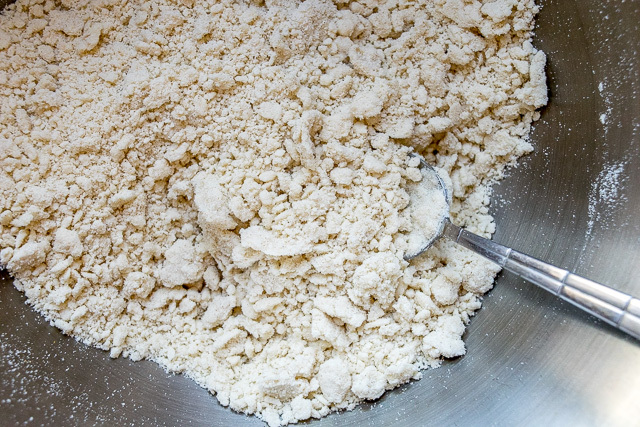 You can dial it back by adding some additional flour to the mixture and kneading. If the dough isn’t forming a cohesive ball you probably need to add a bit more water. Next, we’ll separate the dough into golf ball sized chunks, rolling between the hands to form a smooth ball. This will make the tortillas about 4 inches across. Ideally, the tortilla peels off the plastic effortlessly. If it’s sticking there is probably too much water in the dough. And don’t worry if you don’t have a tortilla press, you can use a skillet or bowl that has a flat bottom. OK, there are two schools of thought when it comes to cooking the tortillas. The first simply cooks them on each side for 1-2 minutes, or until brown spots start to appear on each side. The second flips the tortilla 10 seconds after putting it on the skillet and then cooks each side for 1-2 minutes. The idea is that those first 10 seconds will seal in some of the heat as it’s cooking. I’ve found the second method makes the tortillas lighter and fluffier, so I use that one. It’s a little bit more work, but I think it’s worth it. So again…heat the skillet to medium-high heat. Add a tortilla and flip after 10 seconds, then cook each side for 1-2 minutes or until brown spots form on each side. Don’t be surprised if they start to puff up during cooking, that’s a good sign! 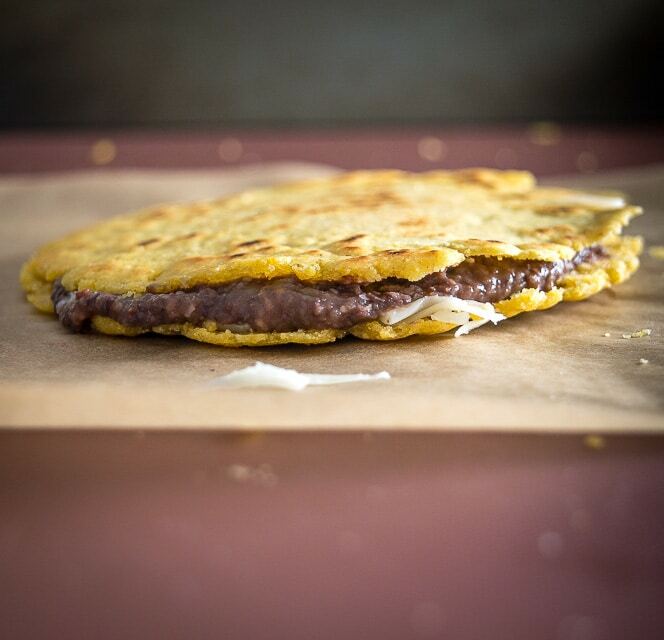 Eventually, you’ll have a stack of warm, steaming corn tortillas. They are best eaten as soon as possible. If you want some friends for life feel free to share with neighbors. These two cups of masa harina made 16 tortillas, each approximately 4 inches across. Not pictured is the tortillameter that you have now acquired for life! Update: Bob’s Red Mill has been my default masa harina lately. See our latest article for a side-by-side comparison: 3 Different Masa Harinas To Choose From. Keep some masa harina in the cupboard and you'll always have the option of making a quick batch of warm, delicious corn tortillas. Add 2 cups masa harina and 1/2 teaspoon salt to a mixing bowl. Add 1 cup of the warm water and stir until the water is absorbed. Add the rest of the water incrementally until the flour melds into a dough. 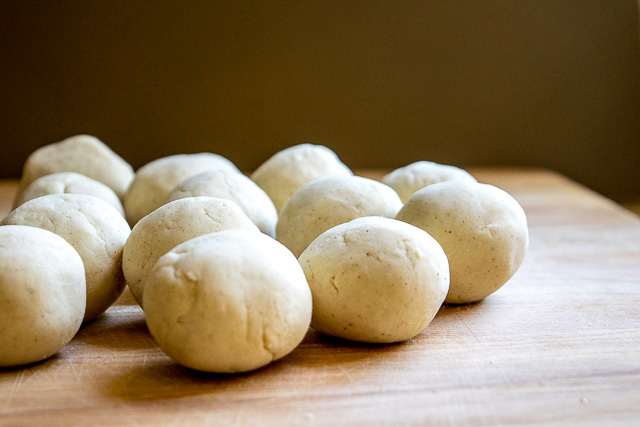 Use your hands to knead the dough into a cohesive ball. If the dough is sticking to your hands, add a bit of masa harina to dry it out. Separate the dough into golf ball sized chunks, this will make tortillas approximately 4 inches across. 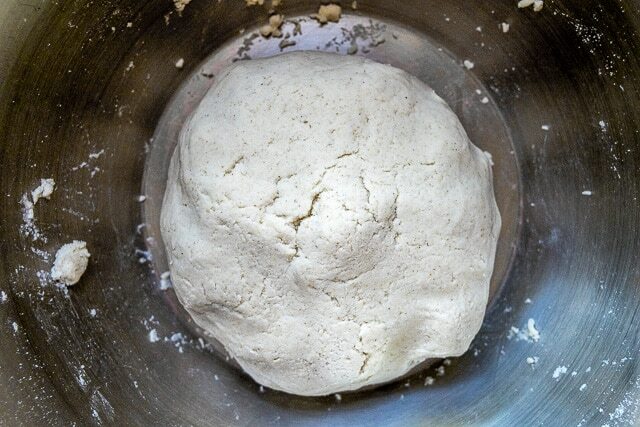 Flatten the dough balls using a tortilla press or a flat bottomed pan. Be sure to line each side of the dough ball with plastic or ziploc pieces. Add a tortilla and flip after 10 seconds. Then cook each side for 1-2 minutes or until light brown spots are forming. Continue cooking the rest of the tortillas. Sometimes it can take some fiddling to get the heat right on the stove. 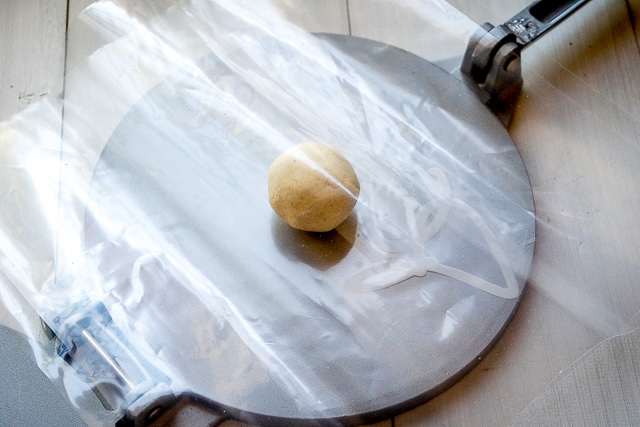 If the tortillas are getting singed black spots quickly, then dial down the heat. Ideally each side takes about 1-2 minutes before brown spots start forming. If you don't want to do the 'quick flip' method, then you can simply cook each side of the tortilla for 1-2 minutes, or until brown spots are forming. 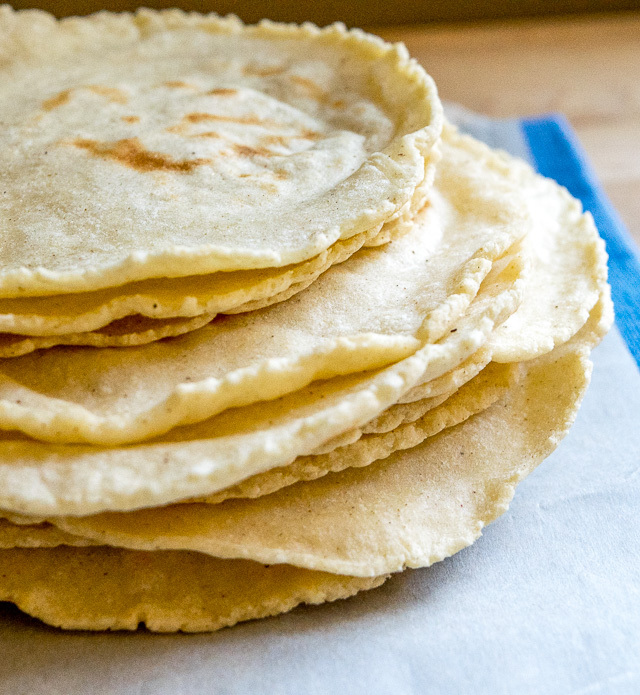 This article we wrote on types of tortillas has a current list of all the tortilla recipes we have on our site, including this one for making corn tortillas from fresh masa dough. We also just used some Masa Harina to make a batch of Tamales. 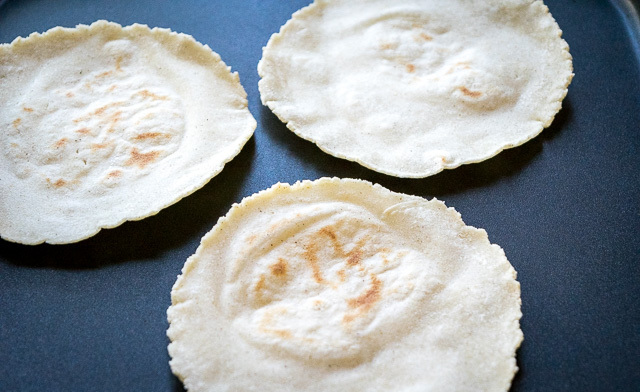 And our latest post shows how to make a batch of tortillas from dried White Olotillo Corn. Are these as crumbly as store-bought corn tortillas? These look great! Thanks for all the step-by-step photos. Seems like you could whip up a batch of these pretty quickly! That’s awesome! I love the flavor of corn tortillas but hate how they fall apart when you try to actually use them. Do you have any idea why store-bought ones crumble and yours don’t? I know this is really old but I would like to chime in that if your corn tortillas are crumbling you are heating them wrong or not enough. Most white, American people I know will try to microwave them or (gasp!) just eat them cold. If you want to have them come out right the best (and only way IMO) is to heat them right over the open flame on your stove. Couple of seconds each side on high heat. They will get a little black around the edges and will not ever crumble. They become super pliable. You have to heat them like this for any enchilada recipe, etc. Every hispanic I know does it this way. Thanks much for your tips Shelby! I was wondering why some recipes online tell you that you need to rest the dough for anything from 10-60 minutes! Is that really necessary? What is the reasoning for it? I notice you skip this step entirely so it doesn’t seem like it’s an essential part of tortilla making! Thanks! Hi Becky, good question! I think it’s probably because flour tortilla dough needs to rest otherwise it’s difficult to roll them out, something about the gluten relaxing/developing. And over time this step gets transferred to corn tortillas as well. 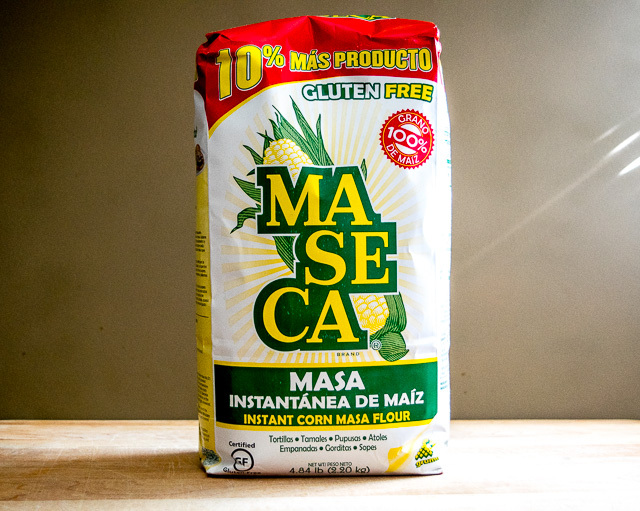 But Maseca or corn flour doesn’t have actual flour in it, it’s just nixtamal in dried form. 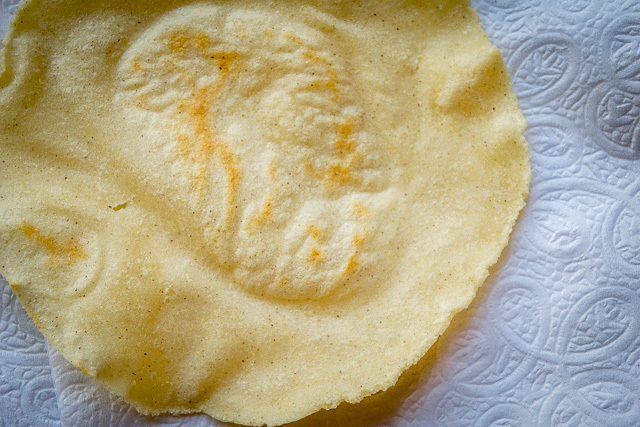 So even without letting it rest you don’t get any of that ‘snapback’ when pressing out corn tortillas — they just flatten and hold their shape quite readily. Hope that helps a bit. Cheers. Aha! I suspected that might be the case. Thank you for confirming that it doesn’t need to rest! Is it ok to make the dough and roll into balls a day ahead? I just made the dough and rolled it into balls. I will not make them until tomorrow. Hey Sue, yeah this should be fine. I would usually just leave the dough in one big clump if it won’t be used until the next day, but rolling them into balls ahead of time should work too. Cheers. I make TONS of recipes from the internet, and I never leave reviews. This is one of the best, easiest, most rewarding recipes I’ve ever used. I’m from Texas. Love me some tortillas. I’ve tried rolling them (to disastrous results) because I really don’t want to buy a uni-tasker like a tortillas press. I have enough cooking junk. The two pyrex pans work incredibly well. The tortillas come out the consistency of flour after resting on each other in a towel. They’re perfect. I had to leave a review. Great recipe. Thank you. Thanks much for your feedback Brandon! So glad the homemade tortillas are keepers for you. It’s kinda amazing how easy it is to get by without a tortilla press eh? Cheers. This was my second attempt at tortillas. I have the masa, the tortilla press… but they keep turning out hard and crispy not soft and pliable. What am I doing wrong? Am i just over cooking them? Hi Kit! Hmmm it does sound like they might be on the stove for too long — about how long do you think they are cooking? I wonder if maybe the heat is too low. I use medium-high heat and this will have those brown spots forming after about 90 seconds or so. Also…you’re using a dry skillet right, i.e. no oil? Hi. I wanted to reply to this thread because I’m having a very similar issue with my last batch. I followed all the steps, but the outcome is dry and crispy without any brown spots. I’m using a dry skillet. Do you think my heat is too low? Also they didn’t puff up in the process! Can you please advise? 🙂 thanks for the help! Hi Briana thanks for getting in touch! Yeah it sounds like the heat is too low if you’re not getting any brown spots. My stove prefers somewhere between medium and medium-high and that usually means brown spots in 90 seconds or so. I only have success getting them to puff up using the second cooking method I mention in the post, i.e the quick flip. So once you plop the tortilla into the skillet, let it cook for 5-10 seconds and then flip it over. This seals in some heat and cooks the interior of the tortilla quicker. Then after that quick flip you cook each side until brown spots are forming, 1-2 minutes per side. 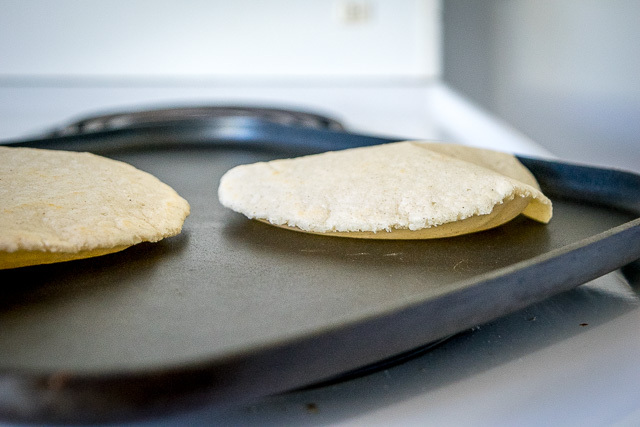 Keep in mind that conditions need to be right in order to get the quick flip method to work — when the heat is right you can use your fingers to slide the tortilla up the side the pan and flip it over. If this is difficult or the tortilla is still sticking to the pan after that first 10 seconds then most likely you need to raise the heat. Okay, hope this helps a bit. Let me know if you have any other questions. Cheers. Hi. People will probably yell and scream at me but I put a bit of shortening (yes–softened lard) in as well–just a bit. Do you really mean for diameter to be 4” on the balls before flattening? That is a very large golf ball! That is a large golf ball! The diameter of the tortilla, once flattened, will be about 4″ if you use a golfball sized round. Thank you, sorry I didn’t understand the first time. Now it makes sense. No prob Kirk I hope the tortillas treat you well! Thanks for the reminder for making these corn tortillas! I used to make several batches a day… Breakfast, Lunch, and Dinner… But got lazy the past few years and just bought the daily-made ones from the store. Needed that refresher; now my grandkids will be enjoying the fresh and hot ones several times a week! I hope the fam enjoys the tortillas Layla! I’m the same, I go through periods where I make them all the time and then just hit pause until I get the craving again. So – it turns out I’ve been making corn tortillas wrong for years. I’ve always used 2 cups of masa harina to about 1 1/2 ish cups of water, a little salt. Fry one side then the other, don’t get colour on them, just basically heat them. Today I used your frying method with a slightly different dough method (2 1/2 cups masa harina, 2 cups warm water, 2 tsp oil, 1 tsp salt). Maybe it was too many changes at once to know what for sure did it for me – but this was a winner, and likely the only way I will make corn tortillas going forward. Awesome, thanks much for your notes Amy, glad you found a keeper combo! I would like to make these ahead for a shower that I am hosting. Would I be able to freeze and reheat these? Hi Jill! Technically yes you can freeze and reheat them, but I think you would get a downgrade in flavor and consistency. They are always best right off the grill or same day and I’ve found that they only last a couple days in the fridge. My family recently got some organic corn meal from a local mill. Can I use that for this recipe? I have no idea the difference between that and masa harina! Hi Dori! 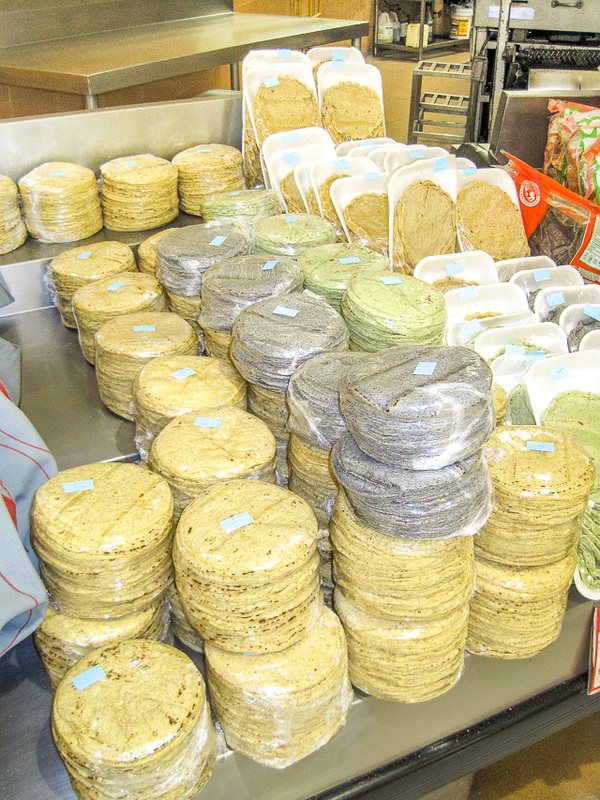 Corn meal hasn’t been nixtamalized (soaked in an alkaline solution) before being ground up so it typically is not used to make corn tortillas, whereas masa harina is always nixtamalized before being ground up. 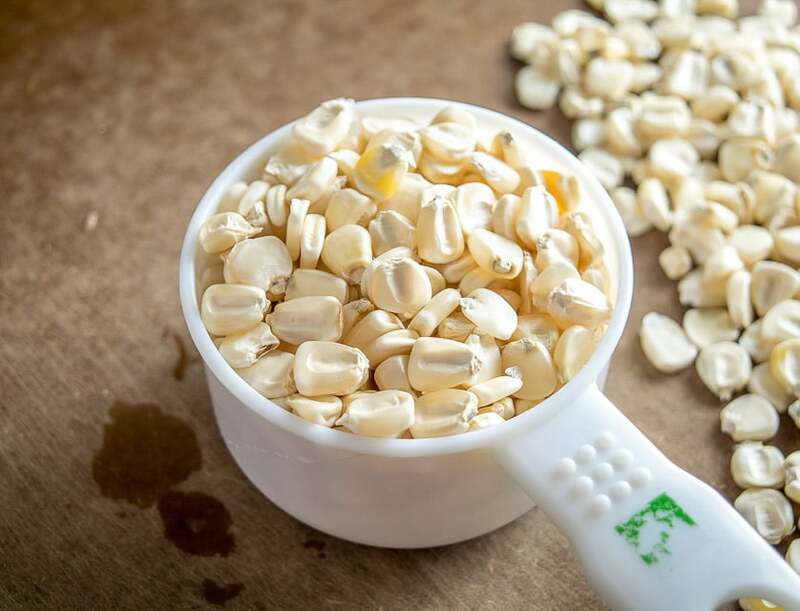 Nixtamalization not only increases the nutritional content but also makes the corn taste better, so you would probably be quite disappointed with tortillas made from cornmeal! Hope that helps a bit. Here’s some more info on nixtamalization. Can you make these larger in size for a burrito? Will they hold together if more like 8 inch diameter? I had the same exact thought! This was about two years so I tried it and unfortunately it was massively frustrating. It’s easy to roll them out into 8-9″ diameter, but I was rolling them out thin and it was nearly impossible to get them off the cutting board without them falling apart. I think it’s probably doable if you make them thicker, but that doesn’t appeal to me too much because I like them best when they are super thin and don’t dominate too much flavor wise. Ha awesome thanks Edward! Don’t forget that you can always flatten them with the bottom of a skillet or casserole dish. There is something immensely satisfying when using a glass casserole dish to flatten them because you get to see them get smooshed! Great info, going to try your 2ND method of cooking. I have a tip for you. Go to the fabric store and buy 1/4 yd of a medium weight clear vinyl, cut into 9″ squares to use (and reuse) for pressing. Thanks for the tip Roxann! If you want to try the method where you give the tortillas a quick flip keep in mind that the temp of the skillet/comal is the key. When the temp on the stove is right the tortillas will start to skate and slide across the skillet in about 5-7 seconds and that makes it super easy to slide them up the side of the skillet and give ’em a quick flip. Good luck! Please Do NOT use vinyl near or on food! It’s not only not food safe but it’s extremely toxic. No pieces of vinyl, no vinyl gloves~ phthalates are toxic! If you need to use gloves please makes sure they’re nitrile gloves & wash them when on your hands before food handling. You might consider using only GMO-free nixtamalized corn so you’re not poisoning self/family with the glyphosate in cheap corn. Educate yourselves too on just what plastic bags do to our food. Stay safe. Going to try this. Have you ever cut the recipe in half or smaller? I don’t need quite so many tortillas for one or two people. Thanks! Hi Susan! Yes, you can definitely cut this recipe in half and you will still get the same tasty results. It’s also worth mentioning that the dough will keep in the fridge for a few days if you want to keep some around. They always taste best right off the grill so if you have some dough in the fridge you can always pull off a chunk and make them to order if you want. Cheers. Thanks! I tried it and it worked perfectly – Cut it in half which is perfect for two people. I added a little garlic powder as well since you can never have too much garlic – wonderful! Great, thanks much for letting me know Susan! Glad it worked out for you. Cheers. Thanks for the feedback Heidi, so glad you liked them! Please note though that some folks are unable to eat anything cooked in cast iron as the iron makes them ill.
A good French ceramic pan by Emile Henry or other great cookware can be substitute safely. Hi, I have recently acquired a press, supper excited to start making my own. Was wondering if you could freeze raw dough balls and just thae when needed? Hi Liezel! I have yet to try freezing this dough but I got an email from someone who tried it a couple weeks ago and it didn’t go too well. She said the dough just kinda fell apart once thawed. Making smaller batches and keeping the dough in the fridge is a good workaround as it should keep for at least a few days in the fridge if not longer (if wrapped tight). Hi Daniel this usually means the heat on the stove is too low. Hey there! I’m making dinner for a bunch of friends (barbacoa tacos!) and am trying to prep as many ingredients as I can that morning. Do you think I could store either the dough balls tightly wrapped, or the flattened/uncooked tortillas with parchment paper between them, in the fridge, until they’re ready to be cooked? 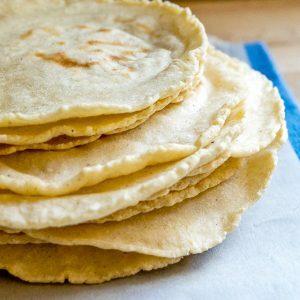 I’d love to be able to take ready-to-cook flat tortillas from the fridge and pop them on the skillet, but don’t want to compromise quality. Hi Tori, those are some lucky friends! I think storing layers of flattened/uncooked tortillas has the potential to be very frustrating because handling them can be tricky. But I make them super thin which makes them more fragile — if you are making them thicker you could probably get away with it. Thanks for the simple and great recipe! 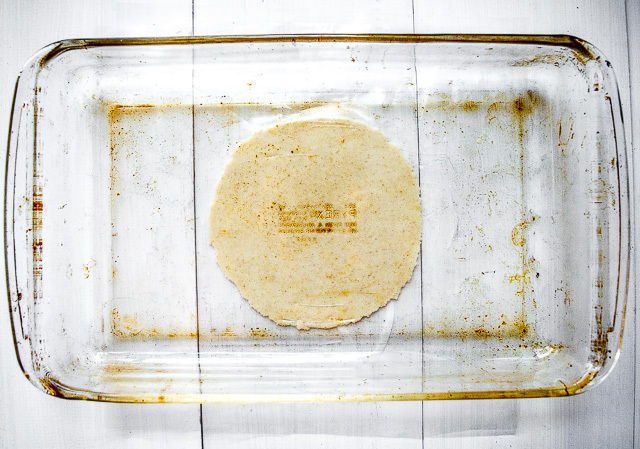 I found that my tortillas didn’t always want to release from the ziplock bag, so I switched to using parchment paper. As long as I didn’t leave the tortillas on the paper long enough to get it wet, they didn’t stick to the paper at all. Thanks for your note Justin that is a good workaround. 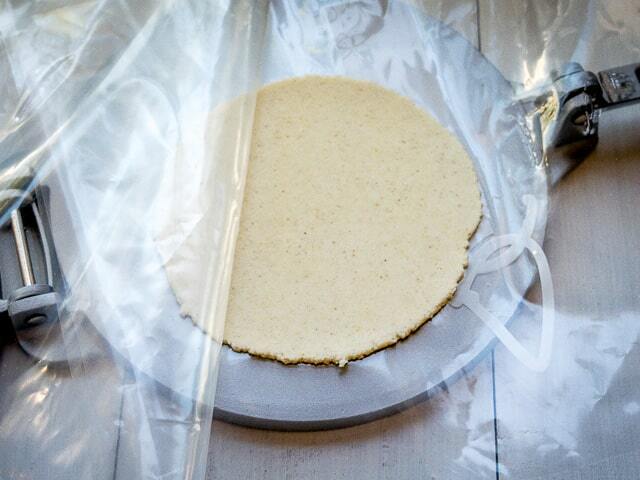 Usually when they are sticking to the Ziploc it means the dough is too wet — adding just a bit more masa harina to the dough will usually take care of it. Sometimes finding that sweet spot is hard but it’s worth it in the end! Hello, I wanted to know, if I decide to make tortilla chips with this recipe, do I need to cook the tortillas first then cut them into pieces and fry, or can I just form and cut the raw dough and fry it? Hi Tiffany! You’ll want to cook the tortillas first before frying them. It is kinda tempting to see what would happen frying the raw corn tortilla dough, but I don’t think a thin layer would survive in the fryer. Cheers. Great Recipe! I tried these today, and the flavor was great. I couldn’t seem to get my tortillas thin enough though using the casserole dish. Do you find that the tortilla press gets them thinner? Thanks again! Hey Jacob, glad you liked the tortillas! Some of the iron tortilla presses can make it easier to get them thinner, but I think it’s worth finding a workaround because there’s a chance you’re going to want them thinner even if you have a press. Skillets or casserole dishes that have a slightly convex bottom can help you get them super thin as it makes it easier to flatten the center of the tortilla. And if you don’t have a good option like that then consider a final pass with a rolling pin after you initially flatten them out (with plastic still on top). Tapered rolling pins can also work well for this but standard rolling pins should get the job done too. Okay hope that helps a bit, let me know if you have any other questions. Cheers. Thanks much for this tip Ree! I think the casserole dish method works better than the press. When I had a press, one side of my tortilla was always thicker than the other. Finally, I just got rid of it. I use a glass pie pan. It is nice to see exactly how “smushed” the ball of dough is, and also is fun for my helper. Ha I know what you mean Mary — there is something really satisfying about watching them get smooshed and it does seem to make it easier to get them super thin. Cheers. We are trying to stop using store bought taco shells. I made these for the first time tonight and they turned out great! And so easy. My kids even ate them. I can’t wait to try some of your other recipes. Thanks Crystal, so glad the tortillas were a hit with the fam! Cheers. I made the recipe per instructions but when cooking them they wouldn’t puff and got.very hard. I used the pyrex method but I think the tortillas were too thick. Do you think I should have added more water? I did not use the over the flame method but used a cast iron griddle. After cooking they were not pliable. Please suggest how I might change it to make it better. Hi Bethany! This usually means they cooked for too long ie the heat is too low. I would try raising the heat. If you’ve got brown spots forming in about a minute then you should be good to go. I do like these best when they are super thin so you might want to experiment with that as well. A dish or skillet that has a slightly convex bottom can help you dig into them and make them ultra thin so it might be worth trying another pan to flatten them out. I hope this helps a bit as I know how frustrating it can be to spend time on homemade tortillas and not have them turn out to expectations. Sometimes it can take some fiddling to get your setup right but I think it’s worth it in the long run. Cheers. Made them last night and my first attempt at corn tortillas and I did use a heavy tortilla press. I made vegetable enchiladas and these were delicious. I filled the tortilla as soon as it came off the pan. Great recipe and super easy. I do think having an electric stove is more difficult in keeping the heat at the best temperature. Hey thanks much for your note Patsy! You’re right, using them right off the pan is a real treat! Hey Kyle thanks for letting me know, so glad these tortillas worked out for you! Cheers. They are delicious but not at all flexible or puffy or suitable for filling as tacos. 😛 Not sure what I am doing wrong, they are very thin corncakes at the moment. Denser than a tortilla (I’musing the glass dish flattening method …too thick maybe?) Anyone have this experience? To elaborate–mine are dense, borderline crispy, and only browning on the edges. :/ With the lack of oil I assumed I needed a non-stitck skillet…maybe that was bad? Truly puzzled, I was so hopeful! We are hosting friends for dinner so tha kfully I have backup store bought tortillas but we use sooo many of those I’d love to stop buying them!! Hey Lindsey! This usually means they are too thick and/or the heat is too low i.e. if they are cooking on the stove for too long they will get hard and dense. I like them best when they are super thin so it’s probably worth trying to get them even thinner. It might be worth trying a different dish/skillet to flatten them out and you can always use some light pressure from a rolling pin (over the plastic) to squish them a bit more. Okay I hope this helps a bit. Cheers. P.S. A nonstick skillet should work fine so don’t worry about that. If they are sliding around in the skillet after 5-10 seconds then you know you’ve got the heat right (usually a little over medium on my stove). Excellent recipe and photos made it easy to make them and they turned out great. Thanks Marco, glad they worked out for you! These are really simple to make and so much better than stop bought. The instructions and the ziplock trick is genius! This is in response to those asking why their tortillas are coming out hard, dry, crispy and/or are not pliable. After you finish cooking the tortillas in the pan, it’s important to keep them wrapped or covered with a kitchen towel while you finish cooking the rest of your tortillas. As you add more cooked tortillas on top of the stack, the heat allows the bottom tortillas to continue cooking a little bit, but the moist warmth under the towel also makes those bottom tortillas soft and pliable. So even though they may be hard and crispy coming out of the pan, they’ll be soft and pliable after a few minutes under the towel.